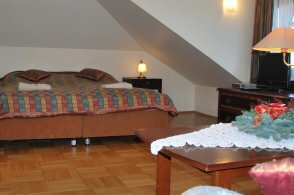 The room is equipped with two single beds, table and chairs. Wireless Internet Wi-Fi is free and the full package of satellite TV channels Cyfra +. Overlooks the south side of the garden. In the room you can boil water in a kettle Wi-Fi, tea, coffee, sugar and towels. The bathroom has a shower, sink, toilet and towel. The room has a double bed. There is a sofa bed which can be used for an additional person, is also a bench, chair, wardrobe, dresser and cabinet. On a flat screen TV we can watch the full package of satellite TV channels Cyfra + and enjoy free Wi-Fi internet access. Overlooks the garden. In the room you can boil water in a kettle Wi-Fi, tea, coffee, sugar and towels. The bathroom has a shower, sink, toilet and towel. 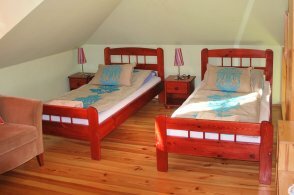 The room is equipped with one double bed, two single beds, a sofa bed and an extra bed. We can watch satellite TV programs Cyfra + and enjoy free wireless internet Wi-Fi. Overlooks the east. The room has a large bathroom with sink, shower and toilet. In the room you can boil water in a kettle Wi-Fi, tea, coffee, sugar and towels for each guest. In addition, the room has a bench and desk with chair. 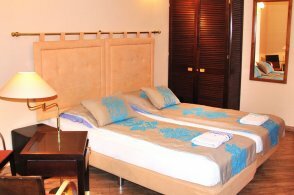 The room is equipped with two single beds, double bed, extra bed can be possible for a adult person. The room is heated by a wood stove type of goat. The room has a kitchenette with a gas, a kettle for boiling water, plates, cutlery, pot and pan. We can watch terrestrial TV programs. Overlooks the south. The room has a bathroom with sink, shower and toilet, with boiler water heater, electric heater for drying towels. The price of renting a room are bed linen and towels for each guest. In addition, the room has a table with 4 chairs. The room is equipped with double or twin bed, extra bed can be possible for a adult person. he room has a kettle for boiling water, plates, cutlery, pot and pan. We can watch terrestrial TV programs. Overlooks the south. 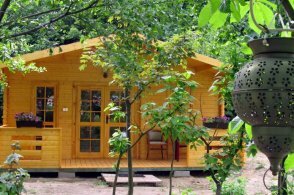 The room has a bathroom with sink, shower and toilet, with boiler water heater, electric heater for drying towels. The price of renting a room are bed linen and towels for each guest. In addition, the room has a table with 2 chairs.